EXPERIENCING THE LIFE PULSE AS AN INFINITY SYMBOL. Combine the cosmic principle of expansion, stillness and contraction with individuality and connectedness, potential and resilience. How can we bring the genius potential in each other into being? The answer is remembering this fabulous cosmic principle of the life pulse that exists in every living being and group being. What are the crucial ingredients of this magical infinity symbol? The life pulse is a cosmic principle that governs all of life in the Universe. It is pulsating and endless moving. It has three aspects, which are expansion, stillness and contraction. They follow each other, are intrinsically connected, one cannot without the other. An easy way to connect with the cosmic principle of the life pulse is silence. Bringing our attention to the stillness, the purple in our image, in the middle in the bottom area. This is the arriving out of the muchness of our current life circumstances, with all that happens to us and around us. In this fascinating silence nothing happens and yet everything happens. If you wish you can experience this silence in this moment. The stillness is the gathering of momentum for the next phase of the life pulse. 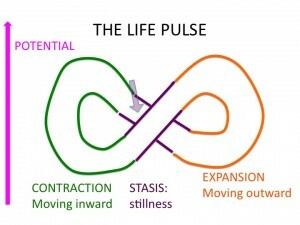 The purple arrow shows how you move from the stillness into contraction (green on our image). It is an inward movement where you transform the outer potential offered through the exploitation into inner potential through nourishment, consolidation and integration. The wave continues and invites us to let go, which feels like a letting go of inner potential in order to achieve outer potential. We let go to create space. At the end of the contraction, we move into another moment of stillness (the purple on top in the middle). This is the silence in which we listen to guidance. What is the next step in our life, in our organization, our projects? The expansion is a moving outward, towards the other (orange on our image). What wants to be given birth to in the free space created through the letting go? The potential balances towards outer potential as newness is brought into the world. It is the pioneering. Expansion continues and makes a crucial turn towards exploitation, as you can see this is again accompanied by a movement from outer into inner potential. We have an ongoing wave, we reach again stillness in order to be leaded into stabilization, integration and consolidation. The potential that is touched into has to be integrated. The virtual safe space is created energetically through the endless sign. As if the sacred geometry of this sign holds you. The geometry trusts that you have the answers for your own questions and challenges. The safety has the form of an ongoing wave always originating and always returning to the vastness of stillness. Even if we loose track of the wave, it is there when we return, reminding us of its different aspects. The safety resides within the different aspects of the life pulse. The gentle stabilization and consolidation secures the potential after its movement through exploitation and offers nourishment. The letting go or dying is securing the safety of the whole. The emerging future in the expansion harbors the safety of growth and the application into the world. 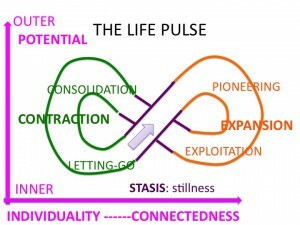 The sacredness of the life pulse as an infinity symbol lays in the uniqueness of each living being and process and the connectedness of all living beings and living processes. The individuality shows itself in the releasing; the letting go is an act that moves a living process or a living being from individuality into connectedness . This connectedness is needed in order for the pioneering, the reorganization to be able to unfold. When fresh ideas or new aspects of the Self arise, the next step is the exploitation, the bringing it into fruition into the world. For this step we need connectedness. We dance between both, it is an and/and and not an either/or though in a wave mode, moving from one to the other. The consolidation and integration is an individual act. 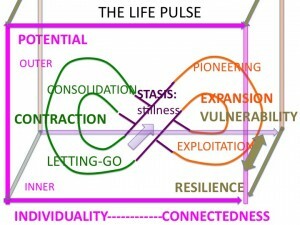 Another interesting aspect of the life pulse representing itself as an infinity symbol is the movement between vulnerability and resilience. There are two specific moments in the wave that we balance towards vulnerability. The first moment is when we move inward in order to stabilize and consolidate; the second moment is when we move into the reorganization, the pioneering. Vulnerability is important and is daring greatly. We are resilient when we accomplish a letting-go, a release of what we no longer need. We are equally resilient when we bring our pioneering into exploitation. Resilience is our ability to recover after difficult situations. This view on the life pulse reveals how it is intricately interwoven with all living processes and all living beings. It is so fascinating and awesome. It brings light into all the natural phenomena and helps us to open up for the field of endless possibilities. We often forget how genius and exhilarating we are. This amazing pulsating infinity symbol opens doors and windows. We need courage and commitment to bring this awareness of the life pulse back into our lives and to play with the different aspects without rigidifying the whole process through control. Each individual has an evolutionary purpose. The question for each participant is: What is my calling to be here? What do I need, what is my longing? What is my offering? And always connected with how can I bring that into the world, my organizations, my life? 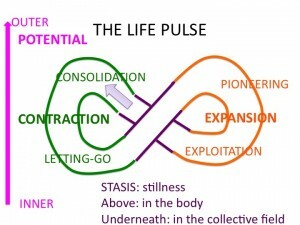 The life pulse as cosmic principle is extensively described in the pathwork lectures (channelings by Eva Pierrakos: www.pathwork.org) the infinity symbol comes from the elaborate work of the Resiliance Alliance, a group of leading organizations and individuals involved in ecological and economic research around the world. The book: Panarchy. Understanding Transformation in Human and Natural Systems edited by Lance H. Gunderson. C.S. Holling. The life pulse is an inherent aspect of the practice of Guest House Facilitation. You can read more about this magnificent practice here on this website ChancesToChange or you can contact me. VEERLE DE BOCK is a social entrepreneur, a change-maker, physician, healer, facilitator, trainer, coach and author of the trilogy, Becoming What is Changing. She spent nearly three decades of her life as a physician specializing in geriatric care, including a 21-year career as department head in an Antwerp regional hospital. In 2003, she began her study as an energetic healer, teacher, process facilitator and supervisor at the Barbara Brennan School of Healing, and since 2007 has been leading many other trainees to master these same skills. In 2010 she was trained in the practice of Dynamic Facilitation by Jim Rough, which she now incorporates into her workshops and training sessions. 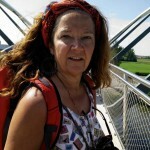 In 2012 she decided to devote her work exclusively to writing, facilitation and coaching. That same year, she devised a new integrative practice of facilitation she calls ‘Guest House Facilitation’, that helps teams learn how to listen and utilise both the inner and outer processes within their organisation, to see it as a dynamic and living organism, and to reconnect to its intrinsic purpose and intention. Her book, Becoming What is Changing: Exposition, is the first part of a trilogy aimed at managers, team leaders and responsible employees who wish to bring this kind of transformation into the workplace, so they can create an environment where people are happy, satisfied and continuously growing. She is the initiator of a Teal Organization: A Mystery School for Life.